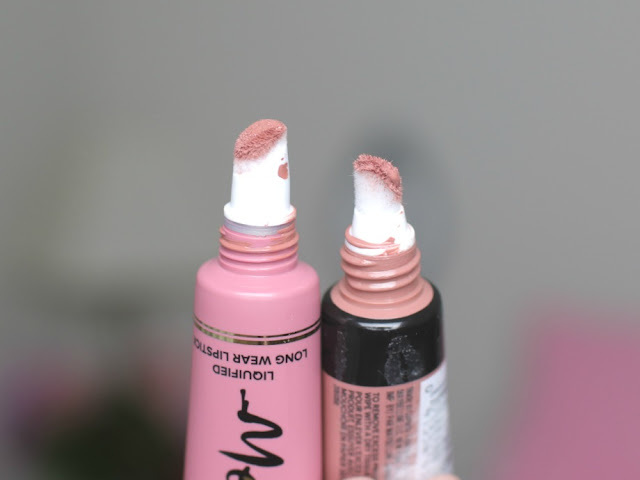 Elle Sees|| Beauty Blogger in Atlanta: Maybelline Color Jolt Vs. Too Faced Melted: DUPE? Or Not? 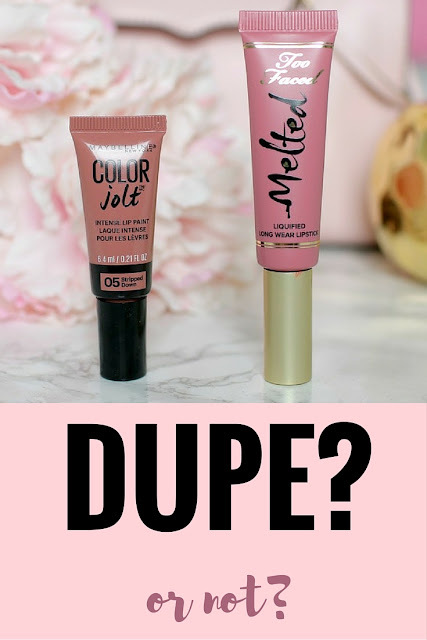 Maybelline Color Jolt Vs. Too Faced Melted: DUPE? Or Not? Do you remember my post from last year when I talked about lip paints? No? Allow me to refresh your memory riiiight here. Lip paints are the perfect compromise of a lipstick and a gloss--think pigmentation of a lipstick combined with glossiness of a lip gloss. You get a bit more wearing time than a traditional gloss and they aren't as sticky. Another way to think of them is as a liquid lipstick. One of my fave liquid lipsticks is from Too Faced, but it's $21. 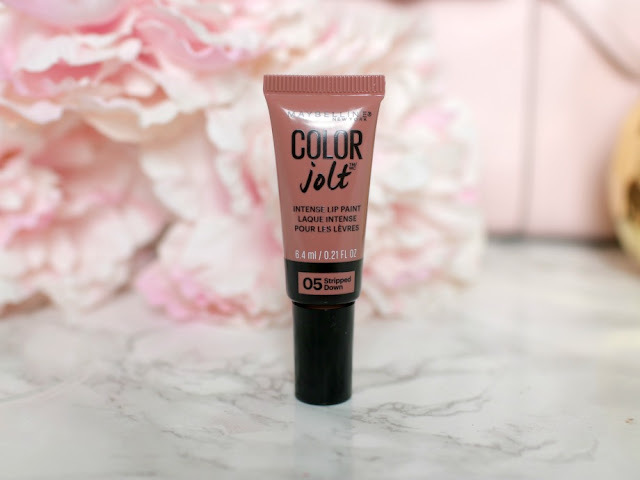 And a few months ago I heard about the Maybelline Color Jolt being released this summer, and secretly hoped it would be a dupe. After a week of testing, I'm here to share my results. Is it a dupe or not? Okay, so we've got some obvious differences in price, size, and shade range. Let's look at the applicators--both have a fuzzy doe foot, with the Maybelline having a hole in the middle for product to come out of. Too Faced has 5 tiny holes where product is dispersed. The TF applicator is slightly larger. Now let's look at swatches. I apologize for the lighting, but the only time I had to shoot these was at midnight, so I had to bust out the artificial lighting. They look similar, but the Too Faced has a little more brown and is a glossier. This is interesting, as the Maybelline packaging is actually more brown than the TF one. Pictures are without and with flash. Here is a half-and-half swatch. On your left is Too Faced, on your right is Maybelline. Very slight difference, right? However, when I used a lip brush to apply it on a friend, the difference was more obvious. It really depends on your lip pigmentation. 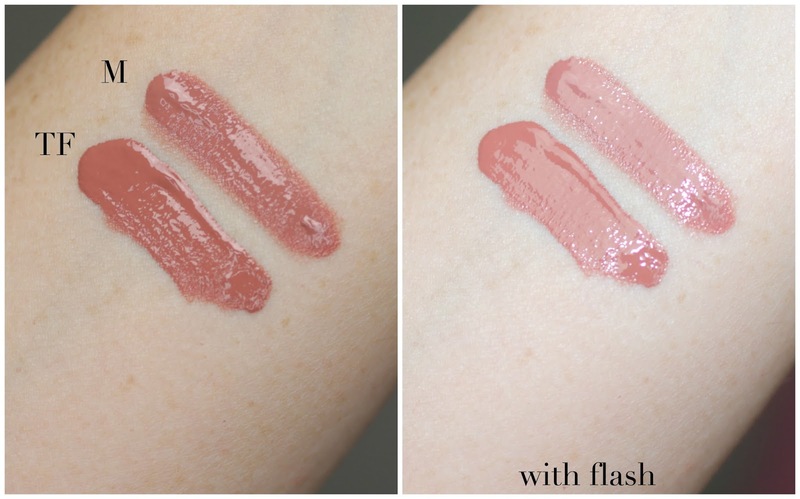 The Maybelline Color Jolt in Stripped Down 05 is closer to my natural lip color. When I recreated this on myself of the half TF/half M for my friend, she couldn't tell they were different from a distance. When I asked a 2 year old, she ran off (#typical). And when I asked the 6 year old she said, "You look like a hatch in progress." So overall, look-wise, they are very, very close (on my lips). Feel-wise, glossiness-wise, staying power-wise, I really like Too Faced the best. I do like Maybelline, but it is SO tiny, y'all, for that price. Tiny. Have you ever tried a liquid lipstick or paint? Happy early Fathers Day to my step-dad! We love you. Thanks Biana for letting me know the new Essie gel polish was on Amazon. I got it that day and have been wearing it all week. Gorgeous! Did you see my Snaps (ellesees) of it? If you're in Atlanta this weekend, stop by the Makeup Show so we can chat! I'm going as a guest of BeBe & Bella. I can't wait to do some shopping! They look so similar and I love that shade! The Maybelline is tiny but it's a good size to try. Have fun at the makeup show! Thanks for sharing this comparison! I really love Too Faced so not sure if I'll try the Maybelline one. Have a great weekend Elle! They look so similar. I totally love both the colors. I think I need to try the Too Faced one, I really love it. The maybelline was is so small. I would probably use it all up in a week. haha I'm always fixing up my lipstick. Looks great! I am all for a cheaper version. I need to try this out. I'll have to try out the Maybelline one. I have two of the Too Faced ones and love them but have to wear with a gloss on top. Great review Elle! They really do look so similar, but for the size of the Maybelline, you'd probably end up spending about the same amount to get to the size of the Too Faced. I'm telling you, I think that I need to try this type of lipstick out though because normal lipsticks always seem to dry me out. Wow...I love these comparison posts. I am running out to get the Maybelline version! 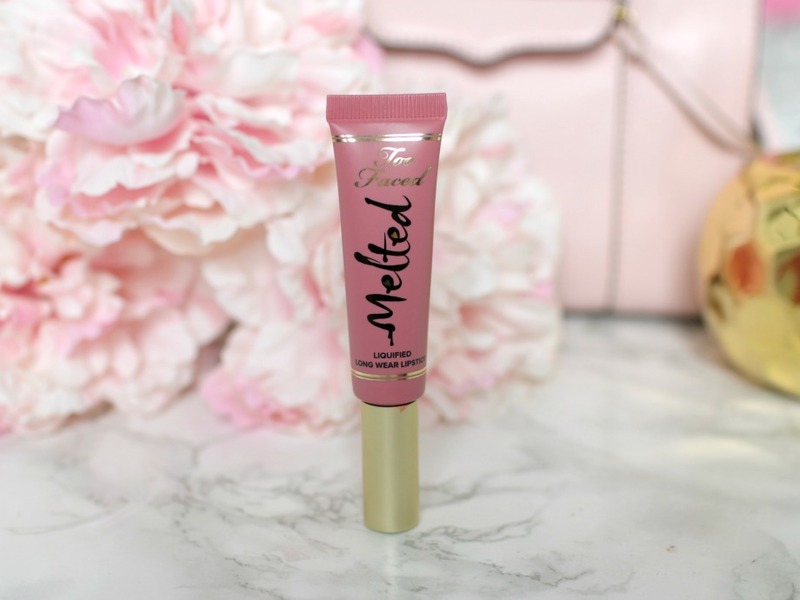 I have only got the Too Faced Melted Chocolate Liquid Lipstick which I adore, the formula is lovely. I can't believe how small the Maybelline one is! They do look familiar on your lips. I haven't tried the liquid lipstick from Too Faced or anything from Too Faced in general so I might pick up the Maybelline one to see if I like it. They really do look like the same color! The Maybelline packaging does look really tiny -- you could buy two of the Maybelline for the price of the Too Faced and probably have close to the same amount of product! Have fun at the makeup show! They do look super similar, and I like the color of the maybelline better I think. The tube does look pretty tiny, but maybe I'll try to snag a coupon and pick it up--it looks like a color I would wear a lot! That Maybelline one really is tiny!!! I have been meaning to grab the Too Faced one to try but always get distracted by other things before I can get to it haha. The TF one does look a little more browner than the other which surprises me because of what they look like in the tubes. Good luck at the makeup show this weekend! Thats a good point about the size of the bottle. That is so funny what your little bird said. She is so funny! ... ps - thinking of you this Father's Day. I know it still can't be easy. The too faced looks amazing! This is a great dupe! I haven't tried either of them, but I'll have to check out the Maybelline one! I love the Too Faced one! They do look similar, but the Maybelline is really small. Even so, I really want to try one! They do look very similar! I actually didn't even know maybelline came out with these. I haven't tried the foo faced ones yet, and I'm not sure why! I do agree the maybelline one is tiny for its price! Yes! I love a dupe of a "trendy" product. Trendy meaning outside of my normal routine I have had forever! Have a great weekend! These are really close! I never even heard of the Maybelline one before. I will have to see if my CVS carries it because I could get this really cheap with coupons. The comments the little girls make that you post about really crack me up! lol Thanks for sharing this with us Elle and I can't wait to see your posts about the Makeup Show! LOVED this post. 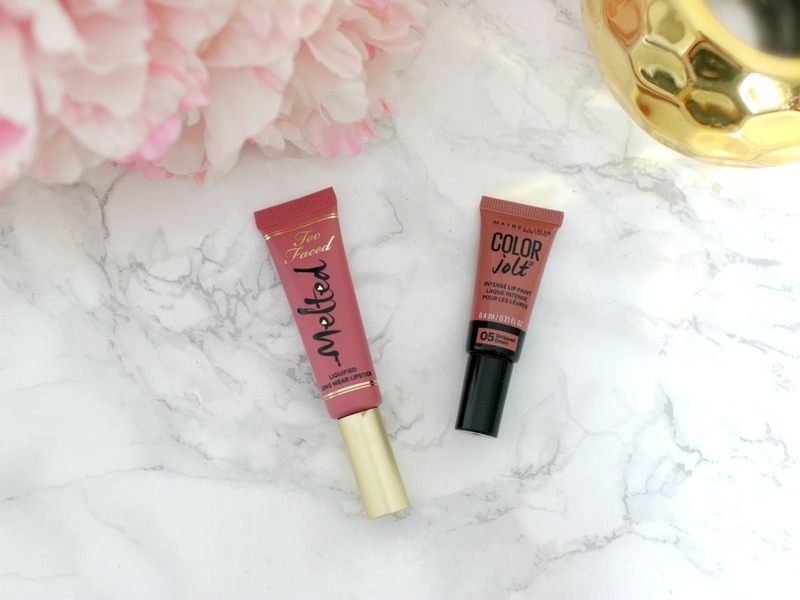 I am a massive fan of the too faced liquid lipsticks and haven't tried the maybelline ones. Those two shades do look ver similar, I could hardly tell any difference. Yeah from the picture it looks almost exactly the same, butI bet it feels different and when you factor in the bigger size it is worth the extra cash. That's actually a pretty great dupe! But I do agree that the Maybelline is priced rather high for such a tiny tube! I bought a Color Jolt yesterday and I'm excited to try it. I thought it was a bit pricey for the amount you get too. I love the Too Faced ones as well! I like Too Faced very much, but then I like Maybelline too :) But if I had to choose now, I would stay with Too Faced, it looks more glossy and a bit more pigmented, although you said it depends, of course, on lip pigemntation. And the 5 holes of Too Faced seem to be better to apply it! I would like to buy it! We don't get Too Faced here, so I was contemplating getting the Maybelline ones. Thank you for the comparison. They are very similar! Love the color of both of them! Interesting that while the Maybelline is cheaper when you calculate it out, the Too Faced is actually a better deal per ounce! Love these shades! So good to hear real comparisons between the two! Looks like I should give the Maybelline Color Jolt a try! I love the Too Faced Melted lipstick but they're a little too pricey for me to collect all the shades! 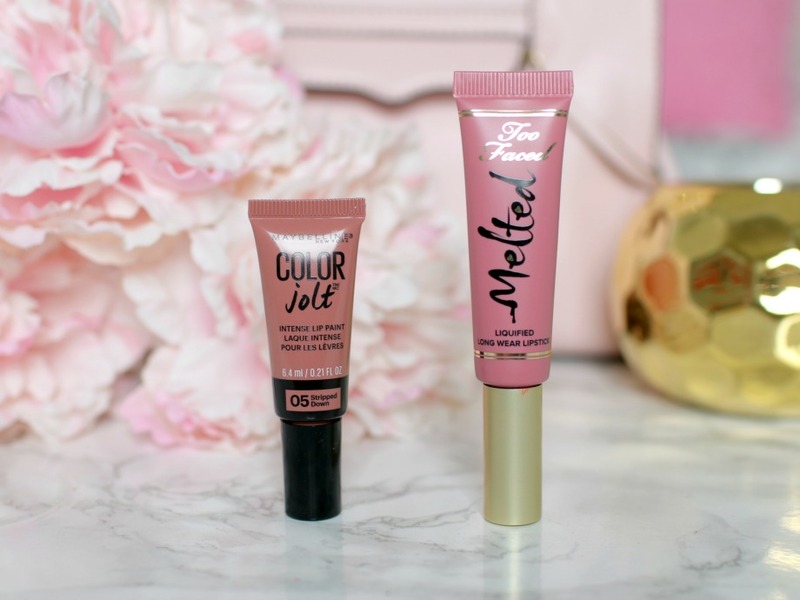 They do really look similar but I have heard so many great things about the Too Faced one so I might try that one. The size is a big difference, but I don't ever use up my glosses so I don't think it would matter because the color is so close. Great post! I have the two faced one and I'm obsessed! But the maybelline looks pretty close for the price! I really want to try this whole liquid lipstick thing..! I haven't seen the Maybelline Jolt's anywhere yet...but they do look tiny. I love the TF Melted! I saw the Maybelline one in Target and was wondering if I should pick it up. Kicking myself for not picking up a few shades.